Please note that this conference is for those who were unable to attend last spring's conference at Washtenaw ISD. Information and supporting documents for the concurrent breakout sessions held following the keynote can be found below. 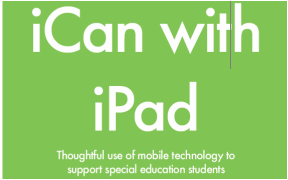 The schedule for the sessions can be accessed by downloading the file "iCan with iPad Session Schedule." From screenshots to shortcuts, learn all of the basic "how to" information for using an iPad. This session takes a look at the built-in features and apps that come with your iPad, while shining some light on how to incorporate these ready-made elements into the educational arena. This session also includes some light iPad management information for novice users. Note: Please have your iPad updated to the latest operating system. Click here to download the presentation from the Wayne ATRC Weebly site. App to download for this session: Good Notes (free). Note: If you already use Good Reader to annotate PDF documents, then you will not need Good Notes. Doodle Buddy, Show Me, Dropbox, Educreations, Inspiration Maps (Lite Version), Good Notes, Dragon Dictate, iBooks, Readability, Adobe Reader, Visual Timer, and DocScan. Explore how the iPad can be used to provide learning experiences that will fully engage students. The provided example makes use of several built-in iPad apps as well as a free app, Doodle Buddy, which is available from the App Store. During the first portion of the session you will get an overview of the example learning experience and the apps used in it. The last part of the session will highlight additional free apps that work well with creative, learning experiences. Leave with a collection of practical ideas to make a difference in student engagement while learning on an iPad. Click here to download a PDF copy of the learning experience, "Land of My Ancestors." Click here to open a Google Doc with a list of apps that can be used for learning experiences. The document also contains links to tutorials for each app. Note: You cannot download this document to your iPad. You will view it in Safari.